1941 - Railbus servce began with Mack Railbus "A"
- Last US armed train robbery of Railbus "A"
1958 - Coal operations sold to Clinchfield Coal Co. The beginnings of the Elk River Coal & Lumber Company are apparently often reported incorrectly in the literature. In the most often repeated story, in 1903, at the age of 22, Joseph Gardner Bradley acquired a very large tract of prime West Virginia land, around 102,000 acres. As that story goes, he inherited the land from his grandfather who received it from the US government for "services rendered", founded the ERC&L and became it's president. In his 1994 book, West Virginia Logging Railroads, William Warden attempts to set the record straight by quoting Neva Walling of the Clay (West Virginia) County Historical Society who did research on the subject. According to Walling, the large tract of land, originally called the Elk River Coal & Lumber Association, was acquired by a group of nine Pennsylvania businessmen around 1903. (According to the Jan-March 1977 issue of Goldenseal, Elk River Coal & Lumber was in existence as early as 1896.) One of the nine businessmen was Bradley's uncle. 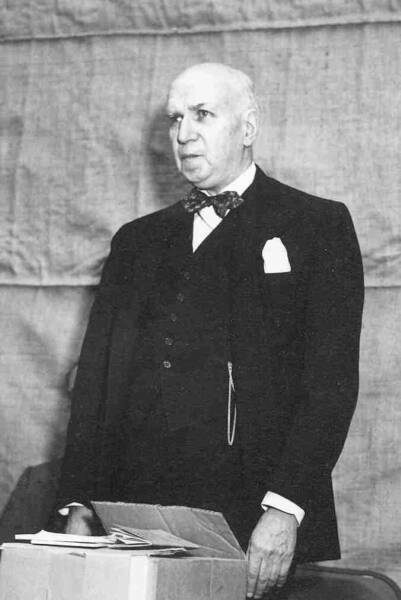 After graduation from Harvard law school in 1904 Bradley became involved in the business and eventually rose to be it's President, a position he held until the sale of the company. Throughout that time Bradley may have been in charge of the day-to-day operations but clearly was responsible to a Board of Directors. It was the Board who ultimately sold the business, not Bradley. The BC&G, according to Walling's research, was in fact, already founded when J.G. Bradley came on board. Early in April (some accounts say April 1, some say April 7) 1904, the Buffalo Creek and Gauley Railroad Company was chartered as a subsidary of the ERC&L Co. to build a 105 mile standard gauge railroad from Dundon, Clay County, to a point near Huttonsville in Randolph County. 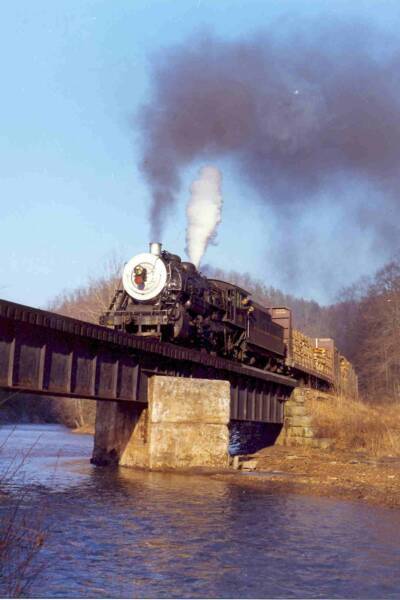 The railroad never reached further than Widen on the Clay-Nicholas County line, a total of 18.6 miles. In a conversation I had in April 2008 with Mr. Peter Silitch and his wife Liesel, who is the granddaughter of Mr. Bradley. Peter stated that Bradley actually was hired by the Board to be the CEO of the ERC&L directly out of law school at age 22. It is Peter's assessment that he was a man a notable management skills even at a young age. 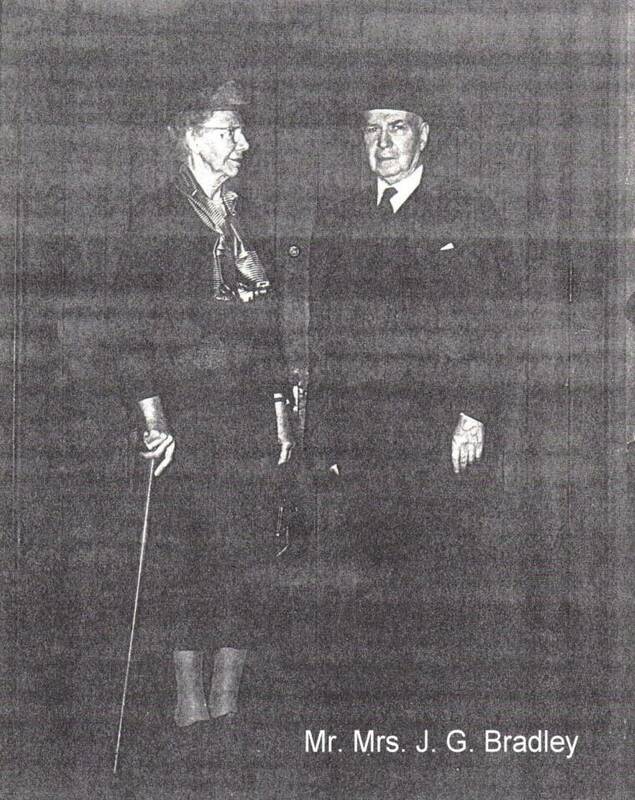 Peter and Liesel further agree that while Bradley may have eventually had a financial interest in the ERC&L, he did not own it outright. Another interesting account of Bradley's role in the organization can be seen in the Official Railway Registry for various years. I obtained these documents to look at schedules but they also list the officers of the railroads. The 1915 edition of the Registry lists Bradley as "Superintendent", the 1929 and 1939 editions show him as "Vice President and General Superintendent" and the 1950 edition lists him as "President and General Superintendent". Admittedly, the Railway Register lists officers of the railroad, not of their parent companies. In the first years, the ERC&L Co. established a coal mine in the town of Dundon. I have seen little information about this mine, although one source reports it was located on the mountain opposite the site where the Dundon company store was eventually built. I found the most complete accounting in Widen, An Appliachian Empire Vol IV, Books 1 and 2. published in 1979 by the Clay County High School. According to that document, the BC&G was built as far a Cressmont by 1909 (some sources say as early as 1905) in support of logging activities. Then in the 1909 to 1911 period the railroad was built the rest of the way to Widen and the Rich Run Mine was constructed. Then, as reported on page 19, the first shipment of coal from the Rich Run Mine was made on July 14, 1911. The fact that the RIch Run Mine in Widen wasn't in operation until 1911 is supported by a finding made by Frank Criswell in the 1908 ERC&L Financial Statement. In that document, there is reference only to the Dundon mine and a proposal for a second mine in Dundon about 1000 feet from the original. No mention is made of mine in Widen. Interesting, even though the Dundon mine closed at some point, the coal from the Rich Run Mine in WIden continued to be marketed as "Dundon Coal" and was marketed as such until the Rich Run closed. As Frank Criswell observed in a 1928 ERC&L Financial Statement, coal from the Widen mine is refered to as "Dundon Red Ash Coal" and "Dundon Low Sulphur Gas Coal". There also seems to be several different accounts of the timing for construction of the sawmill at Swandale. Widen, An Appalachian Empire states that a circular saw mill was in operation at Swandale, then called Barren She, in 1910. This is consistent with the accounting of the construction of the railroad above. It further appears that the bandsaw mill more familiar to BC&G fans was built around 1918. For a more complete history of the sawmills, go to Swandale. J.G. Bradley was the President (CEO) of the ERC&L Co. for almost 55 years. No one else ever held that position. 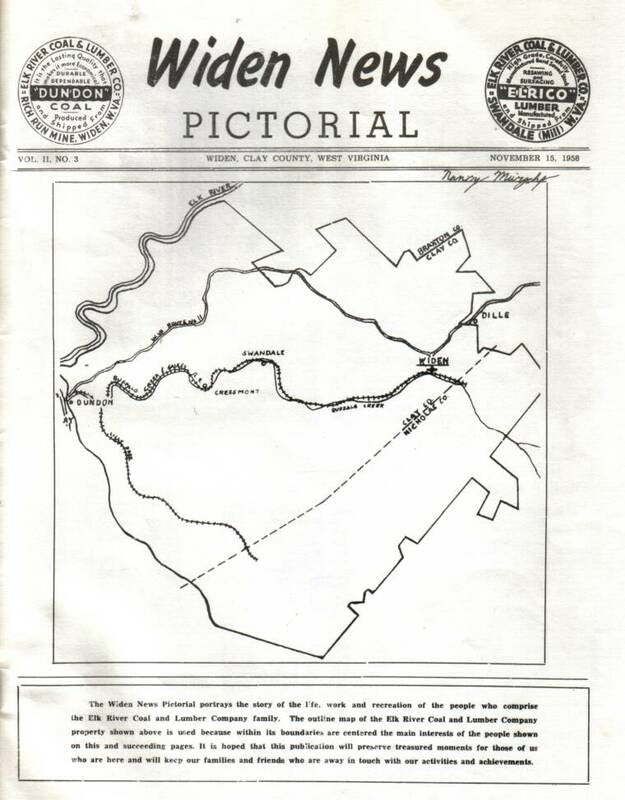 Included in the ERC&L holdings were the Rich Run Mine at Widen, the sawmill at Swandale, a dairy at Cressmont and all the associated stores, schools, homes, churches and recreation facilities throughout the "fuedal system" that Bradley ran. His employees had lifetime employment, modest housing was provided for them, and their children were educated "by the company". Bradley paid his teachers a premium to get the best. Even funeral and burial services were provided. Cash advances were paid in the form of scrip redeemable only at company stores. The hours were long and the loggers and miners often worked six or seven days a week. In a 1993 conversation with hostler Bobby Caruthers, he said "you didn't have hours as such, you just worked till the work was done." Bradley even policed his own towns. State and local authorities didn't enter Widen without permision (WVHS Qrtly, Jan 2006). He was apparently a bit of a loner and rarely went to Widen. His large house was in Dundon. While he was an effective businessman, J.G. Bradley was apparently a man of great compassion and generosity. In the STORIES page of this website are a number of stories that demonstrate this generosity that have been provided to me by those close to the ERC&L Company. A staunch non-unionist, Bradley fought several attempts by the United Mine Workers (UMW) to organize his miners. He was successful in every case, including 1934, 1941, 1944 and 1946, keeping his property non-union the entire 55 years he managed it. The most bitter dispute lasted over a year during 1952-53 with union sympathizers dynamiting two bridges, the Sand Fork bridge and Bridge #4, also referred to as the Robinson Bridge. The railroad became the lifeline for transporting supplies to a besieged Widen. Fortunately, BC&G's Mack Railbus "A" was stranded between the two destroyed bridges so supplies could make the trip from Dundon to Widen with transfers across the downed bridges. On October 3, 1952, Railbus "A" was held up at gun point, possibly making it the last armed train robbery on a common carrier in the US. According to Peter and Liesel Silitch, Mr. Bradley spent 30-50% of his time in West Virginia, but not all of it in Clay County. He was Chairman of the State Republican Party, spent alot of time in Charleston and alot of time at White Sulphur Springs. He also spent alot of time in Washington and Philadelphia. At one point he served as the President of the National Coal Association. Coal sales agents for the ERC&L Co. were located at 2128 Land Title Bldg, Philedelphia, PA and also at 38 S. Champion St., Columbus, OH. An agent was also located at Dundon. (This information is from the B&O Directory of Coal Mines and was provided by Ed Kirstatter. The BC&G's modest engine facility was located in Dundon near the point where the Buffalo Creek joins the Elk River. Dundon is about 45 miles north east of Charleston and sits just across the Elk River from the small town of Clay. About a mile west of Dundon the BC&G interchanged with the Coal and Coke Railroad, later to become the B&O. Even though the mainline was less than 19 miles long, in the 1950's and 60's more than 60 to 80 hoppers a day were exchanged at the Rich Run Mine. In 1960 the annual output of the mine was approximately 1,000,000 tons of bituminous coal and the BC&G was the largest all-steam railroad in the US. The BC&G bought only one engine new, Baldwin Consolidation #4, in 1926, but it continued to acquire steam engines long after other railroads had dieselized. Consolidations #13 and #14 were purchased from the Kelly's Creek and Northwestern in 1950. The ELC&L logging line had three Climax acquired new over the years, and acquired their last steam engnine, Shay #19, from the Cherry River Boom & Lumber Company as late as 1957. This engine, and other geared engines, traveled into the woods along the Lilly Fork. The Lilly Fork varied in length over the years but reached about 9 miles into the woods. For a complete description of operations, see OPERATIONS. In 1958, when Bradley was 77 years old and in failing health and the operations were facing losses, the Board of Directors sold all the properties of the ERC&L to the Clinchfield Coal Company, a division of Pittston Coal, for $5 million. Bradley returned to the east a bitter man as the sale was made without consultation with him. Clinchfield immeditately sold the lumber mill to W.M. RItter Lumber of Roanoke, VA, and leased the land and railroad to them so they could continue logging. The company stores at Dundon and Swandale, the dairy at Cressmont and the bank at Widen were all closed. W. M. Ritter was later merged with Georgia Pacific. 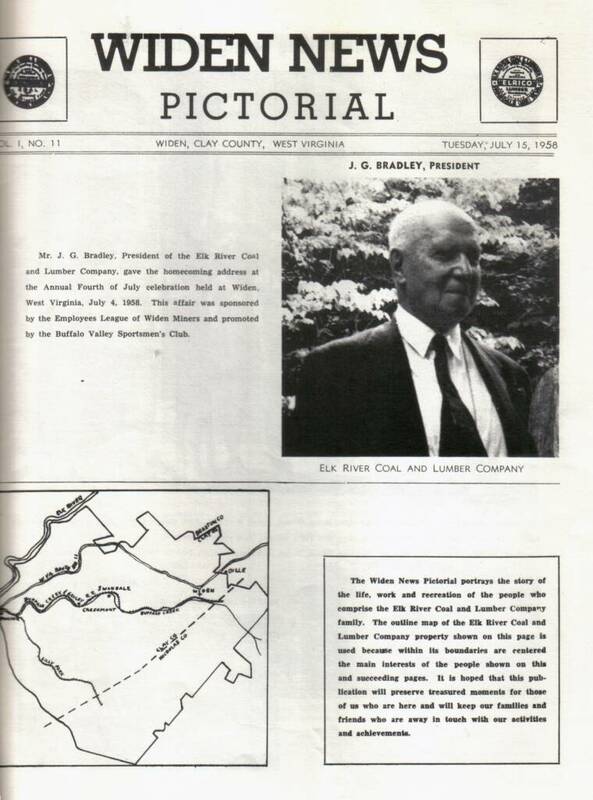 Theodore Griffith reports that after the sale in 1958, Bradley's Vice-President Harold L. Beattie stayed on to manage the company for Pittston until November of 1959. At that point Elsworth L. Hemingway fro Clinchfield Coal Company was named General Manager. It appears that the mining operations at Widen continued under the name Elk RIver Coal and Lumber Company at least until 1961 and maybe until 1963. The new owners immediatly. For more information about how mining was conducted following the sale, go to the bottom of the Widen home page. 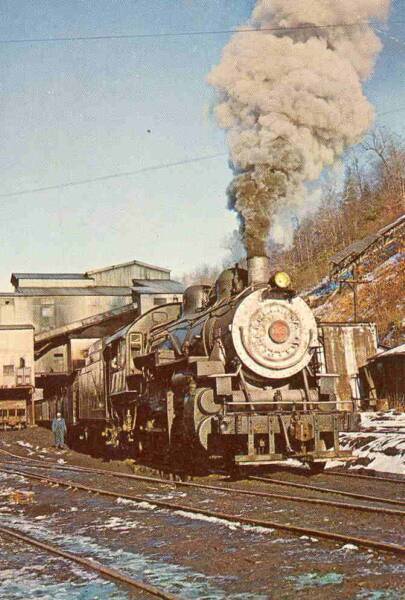 On December 30, 1963 the final coal train left Widen and the Rich Run Mine was closed. With just a 5 man road crew and 3 maintenance men, the BC&G continued to haul lumber from Swandale to the B&O interchange three days a week until February 27, 1965 when the last steam train ran to Dundon (Last Train To Widen, John Killoran, May 1964 TRAINS). Up until this point, the BC&G was all steam, although W.M. Ritter brought a Plymouth diesel, #20, in for logging service in the late 1950's. That engine hauled lumber to the interchange for a short time and the sawmill closed for good in 1968, according to Warden's WV Logging Railroads..
Up until the very end, Richard Manning, General Superintendent, kept the locomotives and rolling stock in excellent condition. As can be seen by the photos on this site, even the buildings were in quite excellent shape right up until operations ceased. There was even a railfan trip in the summer of 1963, just months before the final run from Widen. It is reported that during the final years, as many as 20,000 railfans visited the BC&G to see the last of a great era and they were graciously received by Manning and the crews of the BC&G. This diamond logo was adopted in 1935, dropped in 1942 and was reintroduced around 1959. 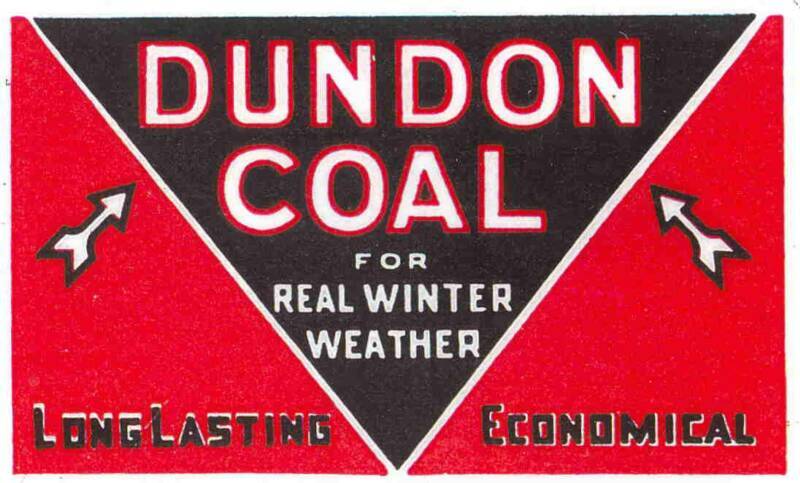 DUNDON COAL - The coal of the ERC&L Co. was marketed under the name "Dundon Coal". According to this excerpt from the April 22, 1922 edition of Atlantic City Gazette published in the May 1922 issue of WIDEN NEWS, Dundon coal was a very high quality product. "The reputation which Elk River coal has acquird among American industrial consumer is due in no small measure to the uniform cleanliness of their product. Unvaryingly, in rush times and in slack, in shortage and in over production, the Elk River company ships from its mines bituminuous coal from which all possible waste and non-fuel substances have been eliminated. The result is that users of their coal effect dollar savings in that they do not pay freight rate and mine price on substances without power value." Judy Gregorich Hart provided the copy of WIDEN NEWS. WIDEN NEWS - Theodore Griffith provided these two issues of WIDEN NEWS, one dated July 15, 1958 and the other dated November 1958 confirming that the ERC&L company was in operation well into 1958 and J.G. Bradley was still at the helm.